any dude that can pull off pink shoes AND a cigar is alright by me. WOOOW! An aloof brother of Shaft in pink suede shoes!! Magnifico! It could have been over the top, but this guy pulls it off. 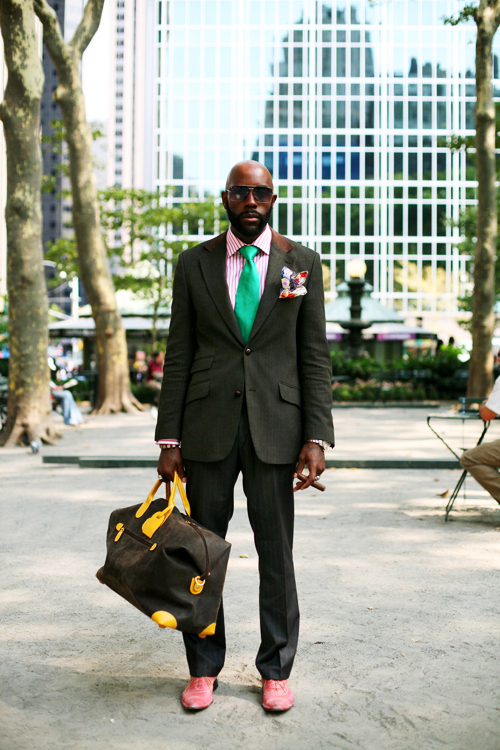 I love the pink suede shoes with the kelly tie and the yellow trimmed duffel. Great use of color with the muted suit! That is officially a strong look. Is that a sports jacket with a suede collar? It’s kind of an overload of well everything haha, but he does pull it together by coordinating the shoes with the shirt and the pocket flower (? ), and I’d say the sunglasses are crucial. Very interesting. its all about balance,and clearly there is something extra in the look that make it ”too much”. is it the tie? the bag (which seems empty and weightless) altogether? shoes? Like the color sense, but not necessarily the implementation. You can have a lot of fun with color, but shoes—well, there’s something about shoes that requires less frivolity, especially with suit or jacket…. Fantastic colors & accessories. And I covet his duffel bag. Ah, Yes! A sign that I can now bust out my fall wardrobe. siiiiiiick. that cat is no joke. This guy has a wondeful eye for color – the easter egg assortment of emerald, mustard, and cherry blossom stand out beautifully against the slated earth tones of his suit. However, I wish he would stand with more confidence! fabulous… and only in new york! 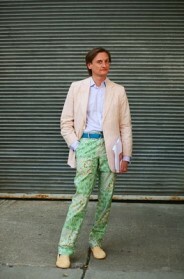 I wound never have thought to put a green tie with pink, love it, and the shoes are fantastic. This is outrageous! An encouragement to us all to mix and match colors. How he gets away with it is beyond me but he is stunning. Wow there is some fabulous color contrasting there. That is a very confident look. how does one get to be so dope? Oh my God, its Sleepy Brown!! Really like this. It works. What is in in pocket though? Looks like a stuffed animal of some sort. Major kudos to any man who can work and pull off such a bright tie. Splendid. İDDAALI Renklerin uyumu çok güzel bir denge de toplanmış.. Tebrikler..
I´m talking about a Brazilian´s Carnival. Mangueira is the most famous samba´s school here in Brazil. And the principal colors are pink and green. It´s a wonderful parade, always in February – In Rio de Janeiro or São Paulo. He is FABULOUS! Not many people have the confidence (or creativity) to pull off an outfit like that. I would have loved to see that guy out and about doing his “thang”! and WHAT pray tell does he do for a living? But as a bystander your opinion is based on how his demeanor conveys his confidence in a (calculated) risk. I like this guy yet too often I’ll look at similar styles that walk a fine line between clever and… um, not. Shut up! That old Jodeci song (“Come And Talk To Me”) would be appropriate here. I really do wanna know him. Not in *that* way, but he’s too interesting to simply walk by on the street and not talk to. That is one stylish man. LOVE the bag! I LOVE his demeanor and the way he stands! Beautiful. Not as much the clothes as his personality. All,but the pocket flower I´ll pass cause he has really done a job gathering it all up. i wonder what’s in the bag? Does anyone know where his bag is from? also i love that he is just having fun with fashion. too many people forget how to have “fun” with a neatly tailored and trimmed look and i feel as though a lot of people who visit and read this blog daily just obsess over getting their outfits coordinated in a sartorial sense that they never venture into anything daring anymore (which feels stagnant). so, goofy colors? not sure they work? i don’t care. they work because they’re unexpected. so, yes please! He is a genius for pulling this look off. Bravo! Great color, but I’d be more impressed if his jacket fit him properly. he looks great! he seems to have just popped up out of a movie! like the look and colors, love the shoes! but it seems like he does it for his job or something, not for him. but well done. I think the bag is DVF, my stylish friend, Joe, has a similar one. BTW, I think the shoes make the ensemble pop! I’m completely on board with this look until the bag. There’s no reason we women should get all the awesome colors and cute accessories, but something about the bold yellow with those pastels (or perhaps just all that additional black? who knows) looks silly. That said, that is solely an impression of his outfit as a photographic work of art; I believe in bags as first and foremost a functional piece and wouldn’t judge anybody for a bag that wasn’t perfectly coordinated or anything. Conclusion? What a fabulous outfit. Re: jayce. b at 9:36 PM: I agree that he is walking a fine line but I think he’s fallen on the right side of it. I do know however that when you ARE this close to the line, people’s opinions will vary considerably w/r/t which side you’re leaning, but hopefully anyone daring enough to take the chance won’t give a flip about some passerby thinking he’s a garish easter egg man. Brilliant! Just wish the handles of the bag were pink. I like the idea, but not the execution – it is over the top. The suede collar and flower like pocket square are good. The pink and green combo work, specially with the shoes. All of it together? Too much. The ill fitting jacket and slouchy posture don’t go with any outfit. The pants could have been an inch or two longer as well, since I am nit picking. This is a man who seems like he has something to prove. I don’t know if my eyes are coated in dust or his shoes and bag are, but something needs attending to. And if it’s his shoes and bag, and not my eyes, I’m surprised a man so focused on appearance would overlook such obvious details. He looks amazing. I am not sure it look in just anyone, I guess he is the right guy for it. Very cool. I really like this guy’s look. Note the ticket pocket and suede (velvet? leather?) collar. What puts this over the top, for me, is that this gentleman is holding a cigar. A wonderful look. is that james worthy? i played ball with that guy in college. Very Issac Hayes – on his way to the country after producing a sam and dave session circa 67. Terrific ! To borrow a line from you Sart, this man is “living the look”. Very well done. That’s just unbelievable. This guy rocked my world with those colors. Wow pink shoes. I would never have the nerve but I like it anyway! Hmmmmm…no. Feels a bit desperate to me. Just too much excess baggage. oh HELL yes! this man makes the outfit. My post is ridiculously late, but I just had to comment after reading the other posts. This guy’s outfit works quite simply because he looks confident and, I’m sure, doesn’t give a damn what anyone else thinks about his attire. Attitude is half of what makes an individual’s fashion sense anyway. Style/fashion should include a bit of fun, even if no one else gets it. I wish more fashionistas and fashion purveyors understood this. Love the blog, by the way! Can anyone identify the bag? I don’t think it’s DVF. It’s similar to a Bric’s, but I can’t find those colors. Are they brown suede and yellow in the pic? This man's got his groove on! Bravo.